The desert is a place to find peace and freedom. 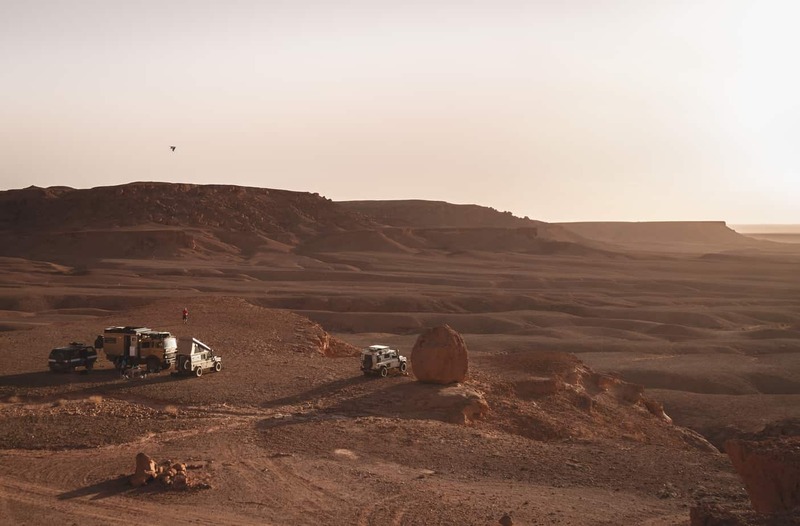 Even before we fell in love with overlanding, we dreamed of camping in the dunes of Morocco. 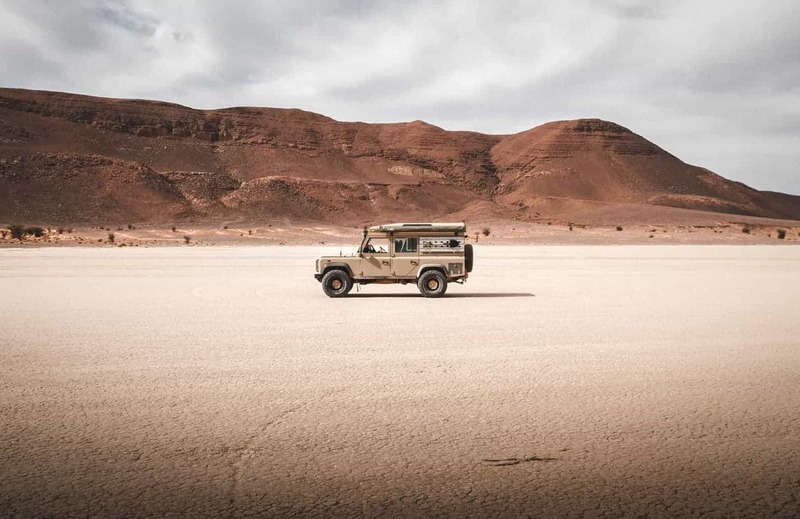 We heard story after story about the amazing country, and each picture of its lonely expanses only served to feed the fire of our burning wanderlust. Unfortunately, life doesn’t always allow us to drop everything to pursue adventure, and so we filed the idea away for some future day. 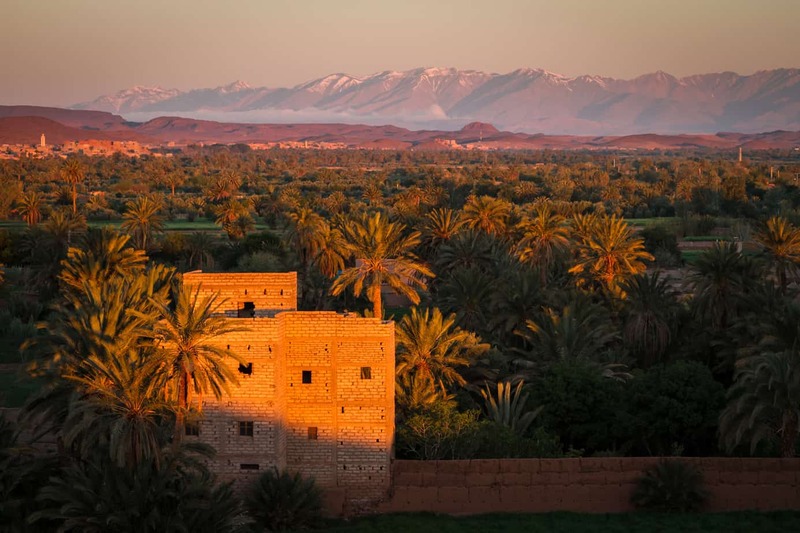 The years came and went, and still we had not been to Morocco. It was time to fulfill our dream. 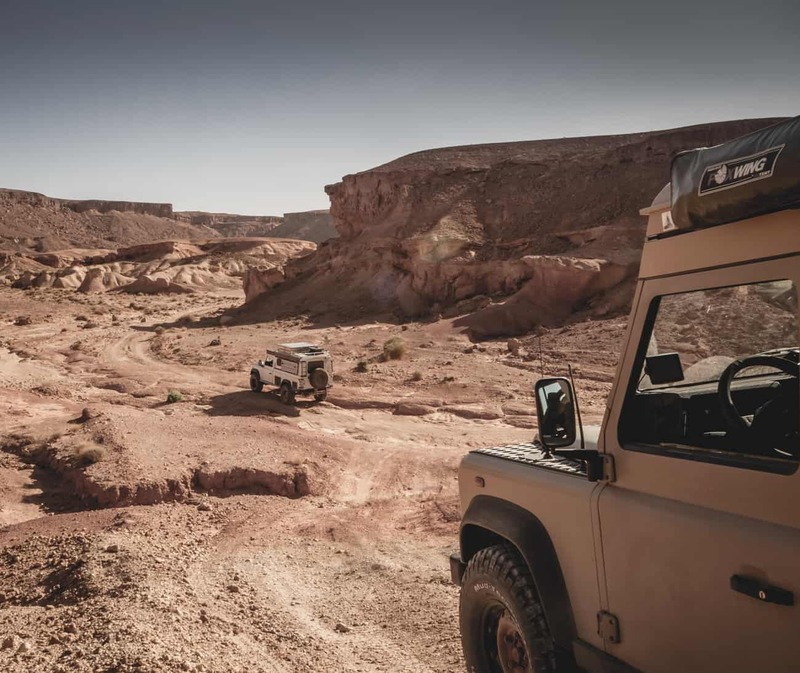 We purchased a Land Rover Defender, and slowly tweaked and modified it to suit our needs. 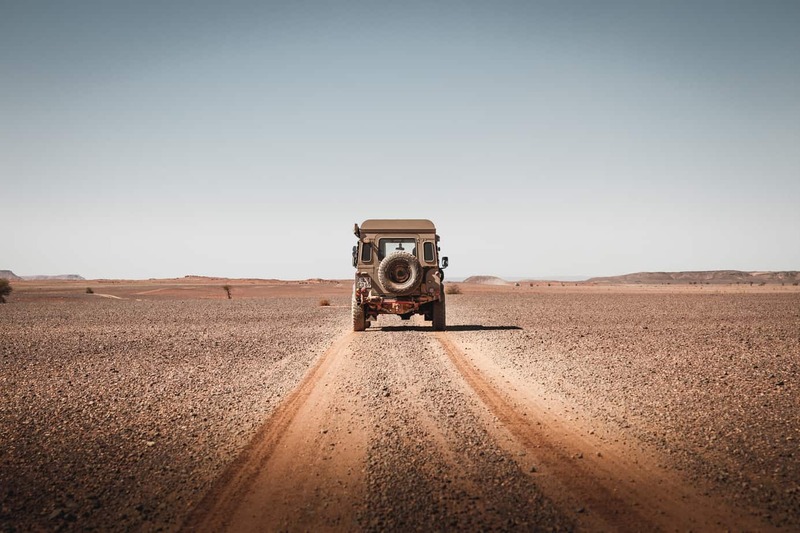 The desert, dunes, and a Land Rover Defender, in my eyes that’s the sound of adventure. The only thing left was to pack our stuff and hit the road. As fate would have it, we would not be traveling alone. A bunch of our friends were amazed and inspired by our idea, and decided to undertake this journey by our side. 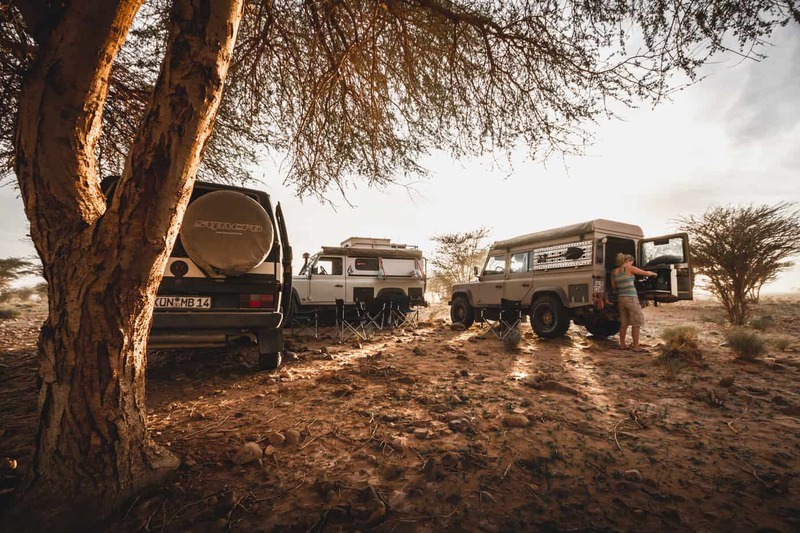 So it was my wife and me in our 2004 Land Rover Defender, Julia and Alex in their equally modified Defender 110, my friend Matze in my old VW T3 Syncro Vanagon, and the Röckers as a family. 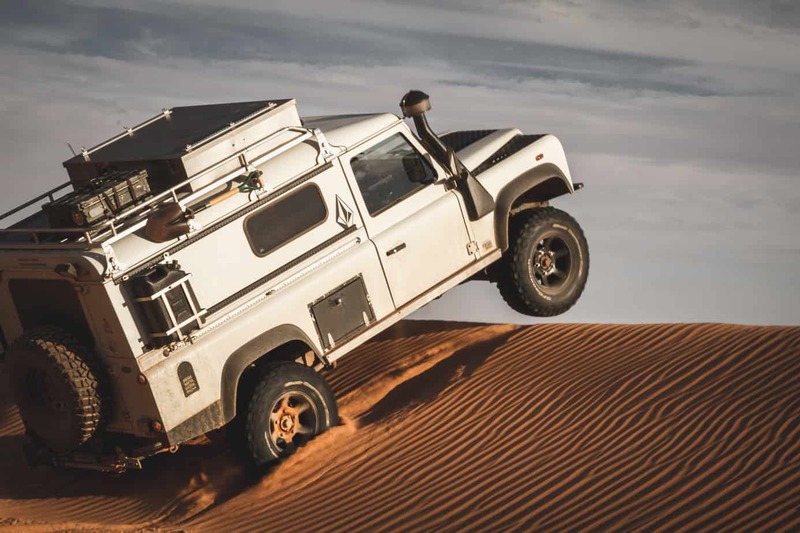 They were driving their freshly built overland Magirus truck, together with their newest child, who was only seven months old. Last but not least, another family joined us. A father and son duo who tried to attack the dunes in their BMW sidecar motorbikes. There’s no better mix of people, I reckon. 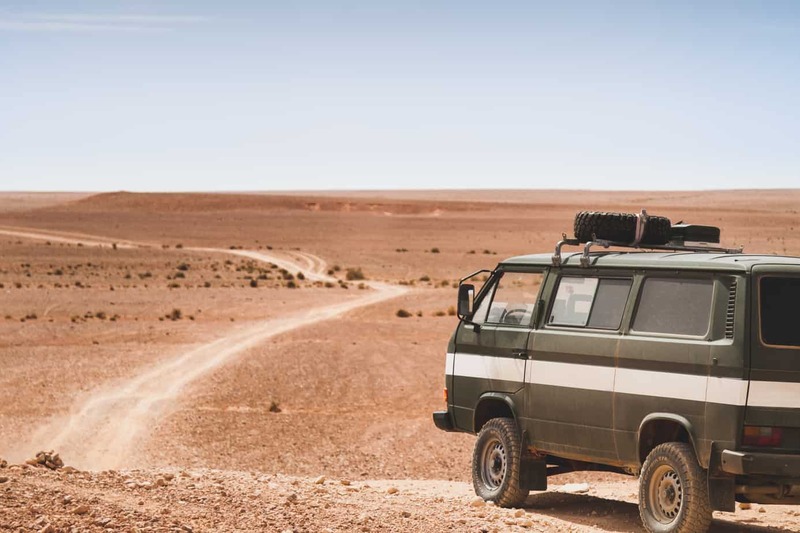 There are many different ways to reach Morocco from Germany. 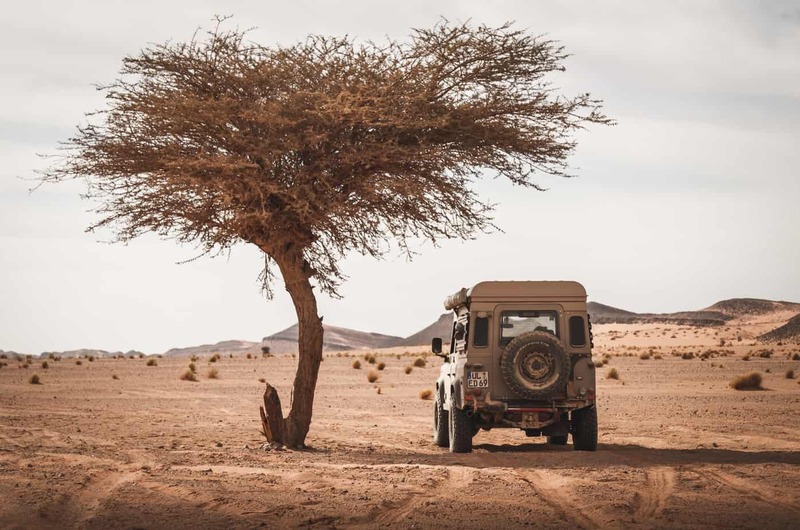 You can either use the overland route to Africa, or you can choose the ferry from France, but it usually takes 2.5 days to get there either way. 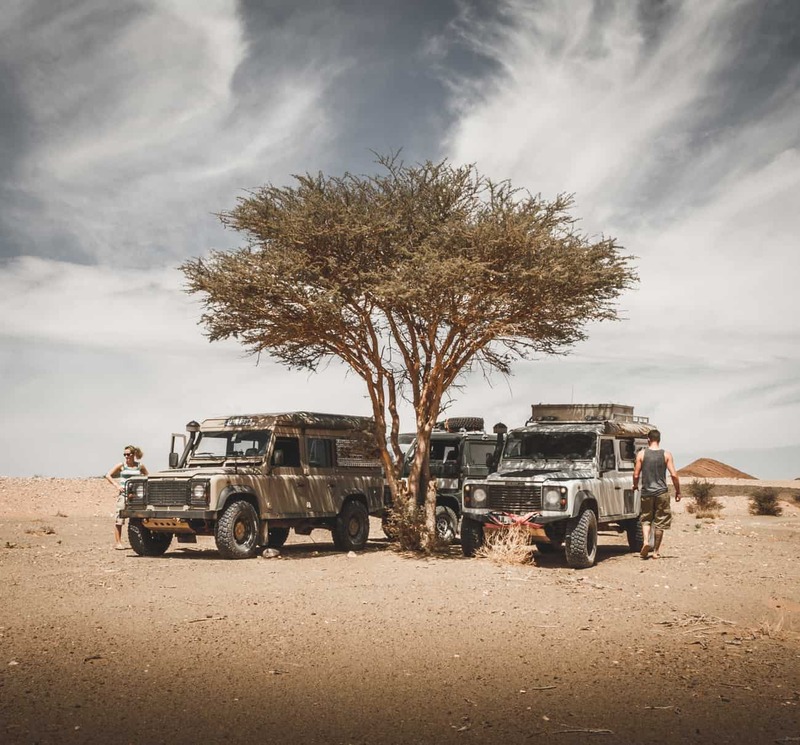 In our case, we wanted to experience the feeling of driving our Defender to another continent on our own, so we decided to hit the road and make some mileage. 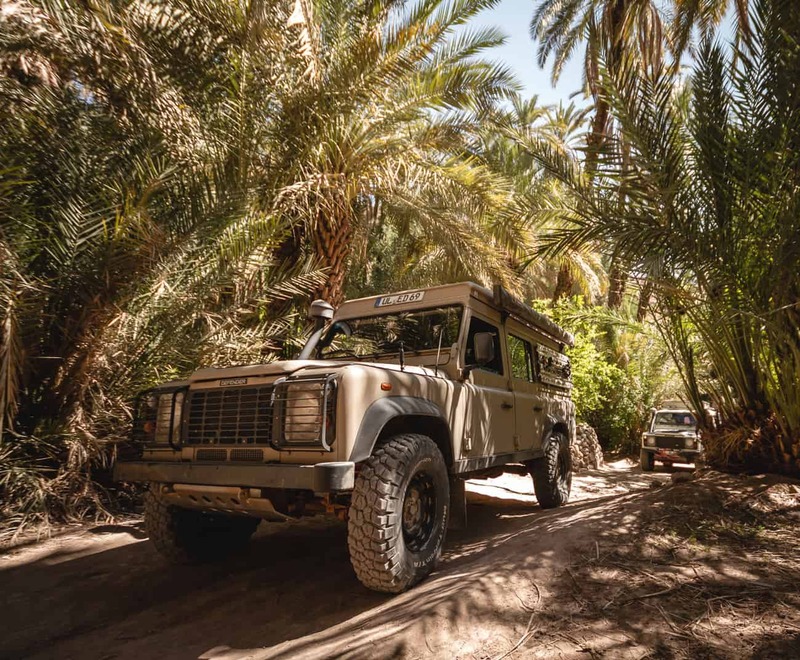 Our friends took different paths due to their timelines, but it was planned that we would meet up in the middle of Morocco at a place called the Blue Source of Meski. After two days of driving nonstop, we finally reached the ferry to Africa. 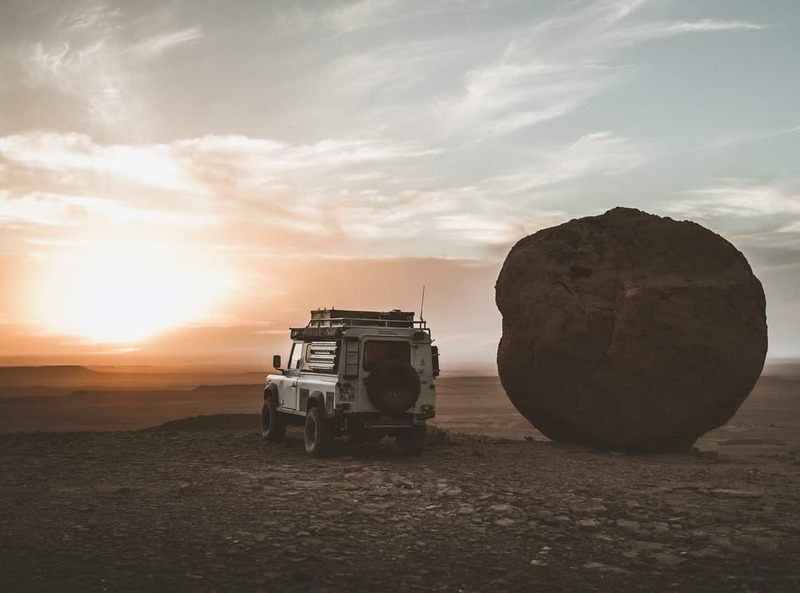 Being so far away from home under the power of our own rig was an amazing feeling, and thus far, there had been no problems with our good-old trusty Defender. We were now just a boat ride away from the adventure of our dreams, and the air was charged with excitement. Sometimes it’s hard to understand that two countries, only separated by several miles, can be the complete opposite of each other. 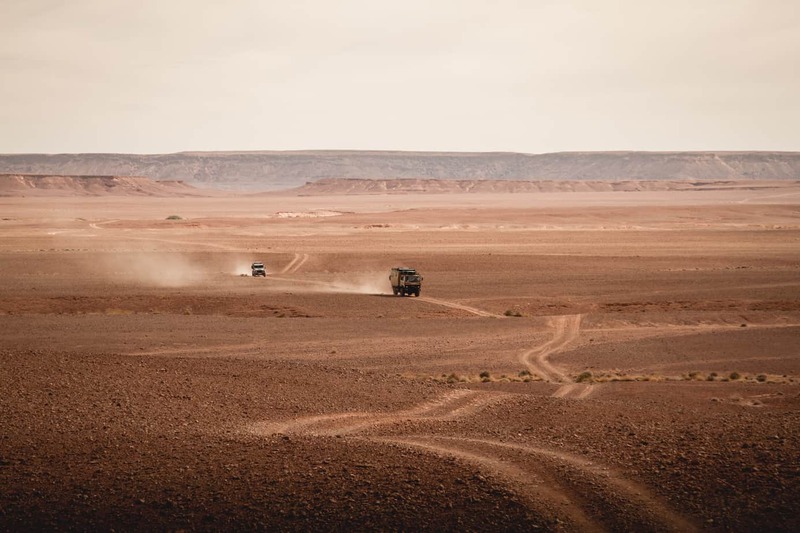 We came to Morocco with the expectations that it would be different from Europe, but we would have never thought that we would actually get the real “Africa Feeling.” Everything was a bit more hectic, louder, and more stressful here, but it was still beautiful. It was the stuff that adventures are made of. After refueling and getting our cars insured, we made our way to the meeting point in Meski. That campsite the first night was one of the greatest we have experienced in our whole lives. It was divided by a little canal, and there were palm trees all over the place. It was the real deal, and we could have easily stayed there for weeks. The reunion of friends only added to the excitement, and everyone had their own story to tell of how it all went down reaching Morocco. It took awhile for the thought to sink in that this was really happening, and that we were actually in Africa! We were all more than pumped to hit the tracks and get to the dunes. 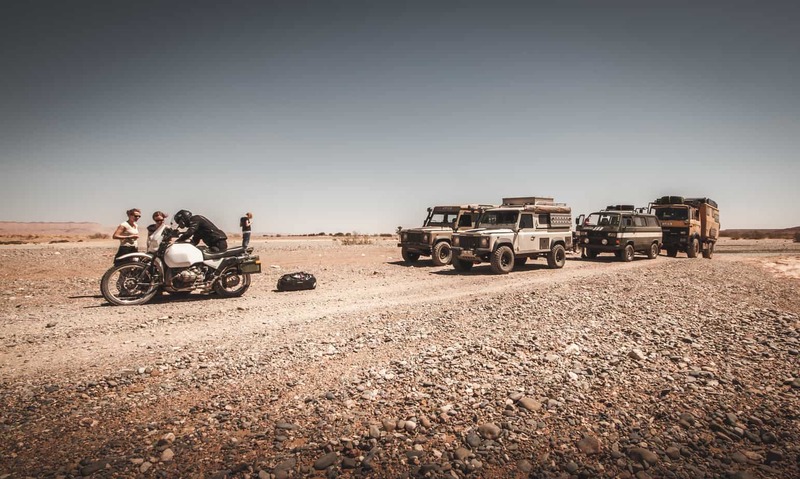 Our basic route would take us clockwise from the tracks along the Algerian border in the eastern part of the country, over to the coast, and then back north via Marrakesh. It was hard to do the exact route planning in advance though because we had no clue how long each single stage would take. In the end, we decided just to give it a try and change plans if necessary. After the brief period of recovery from the exhausting journey through Europe, it was time to go and do what we came here for: leave the pavement. Things became interesting almost immediately. 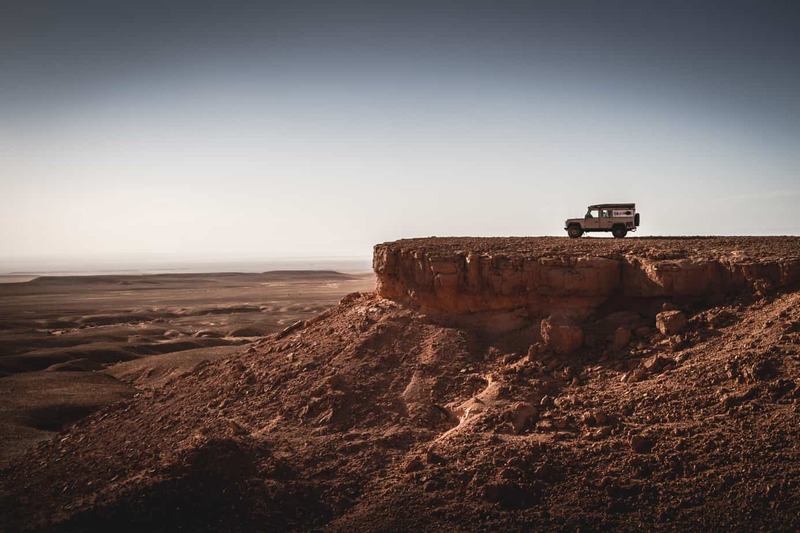 The rocky terrain was fun but challenging, and it was especially difficult for the large overland truck to master the narrow corners and obstacles. In the end though, the Röckers made it through all of it easily. 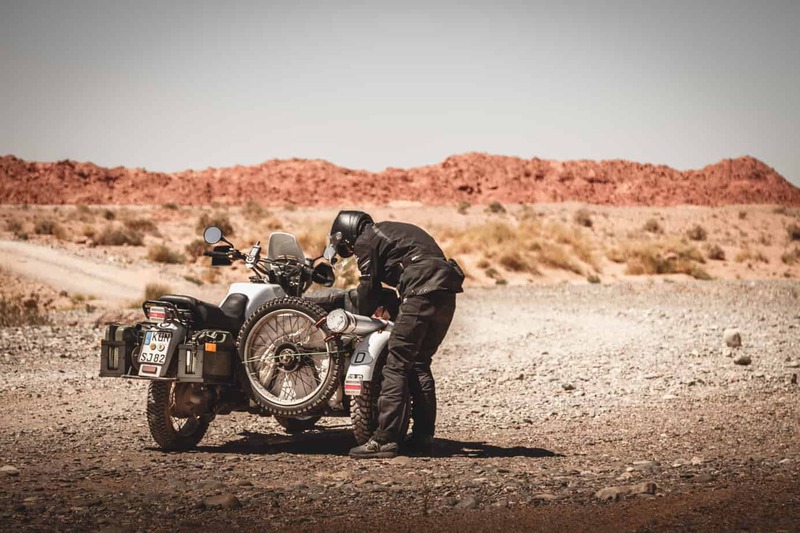 Traveling over the washed-out pits in the Moroccan outback was vastly different than what we were used to in Europe. You could see for miles and miles, but all that filled your windscreen was the heat incessantly blurring the horizon. The freedom of it made me smile. You could camp wherever you wanted, just point a finger and cross the terrain to a place where you would like to spend the night. Only a few days into the expedition and we had already fallen in love with this country, and we would soon fall in love with its people. 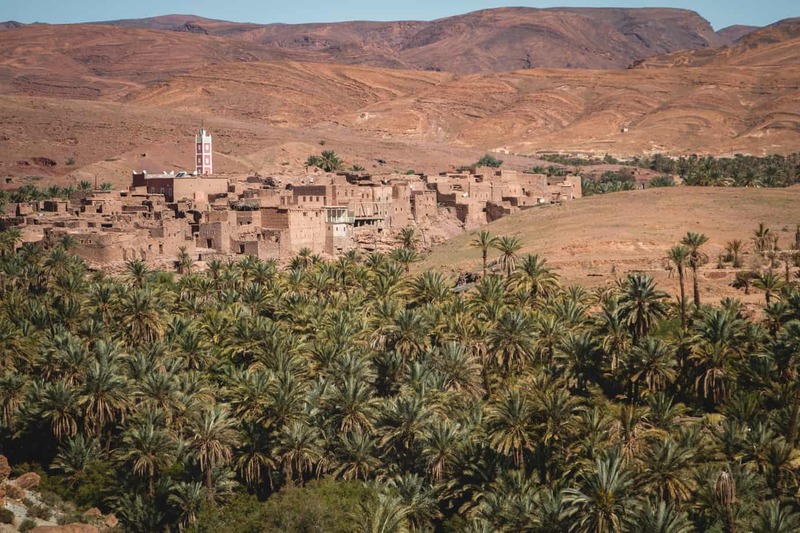 When you visit Morocco, you have to accept that there are two sides to the story. On the one hand, you have to understand that there are huge differences in wealth between you and the locals, and some Moroccans are pretty enterprising when it comes to making money. You have to find a respectful way to deal with that. 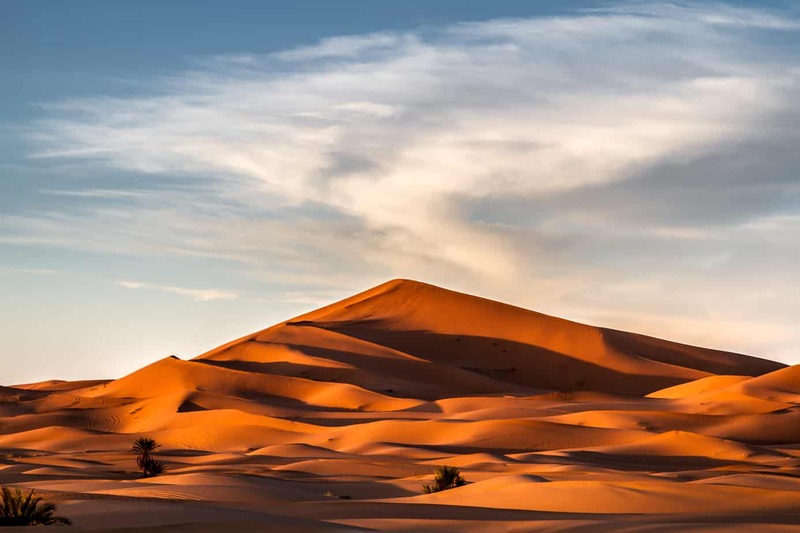 On the other hand, the Moroccans have a long tradition of hospitality and don’t hesitate to invite you to their homes and show you their culture. It’s a wonderful experience, and we could all learn something from their welcoming nature. 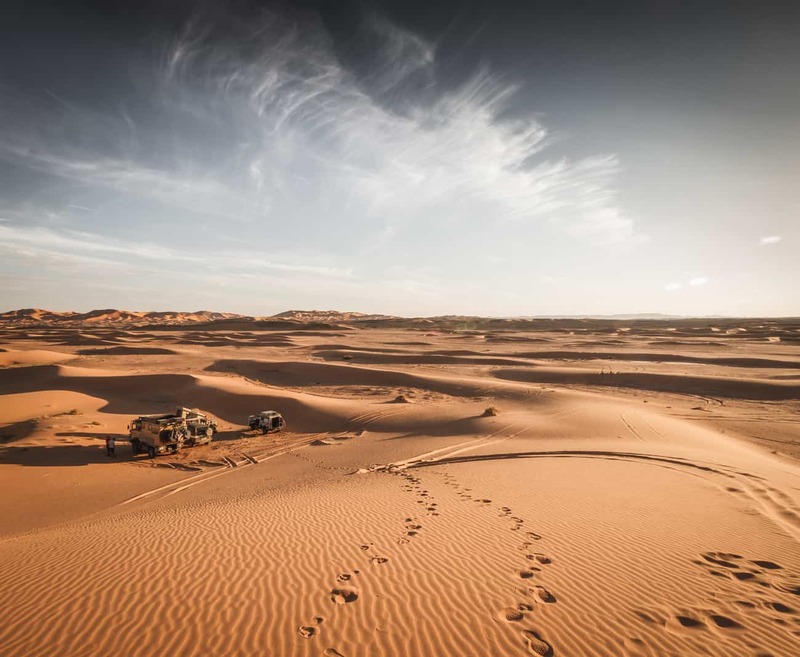 After another two days of driving, we finally reached the dunes of the Erg Chebbi. 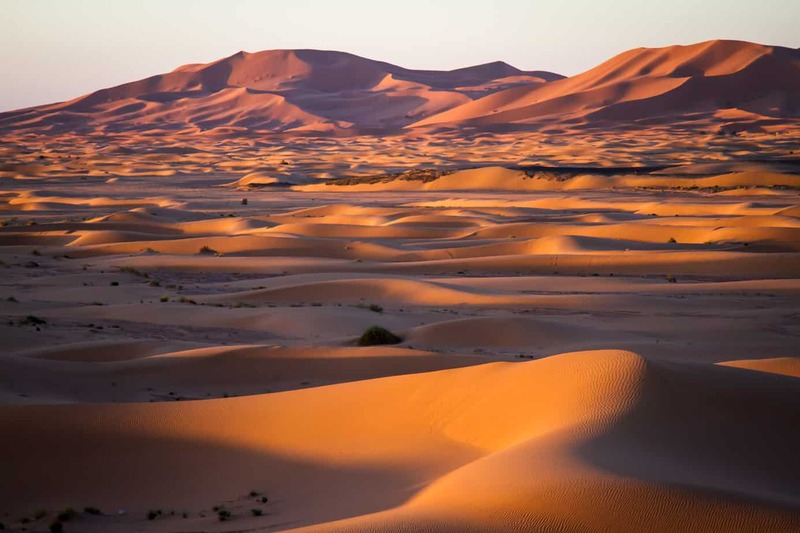 They are the most famous dunes in Morocco and are easily recognized by the vibrant red sand that shines even more when the sun sets. Driving in deep sand was a completely new experience for us, but we were all excited to tackle the challenge, so we dropped tire pressures and set about conquering these huge formations. I have to admit that we were more than surprised by how well the vehicles mastered the soft surface. Newcomers as we are, we went into the dunes at high noon or what is known as the worst time to drive in the sand. This is due to the fact that the surface is much, much softer than in the morning, and the visibility is pretty bad due to the lack of contrast. We had a whole lot of fun nevertheless. But not all of us were enjoying this big sandpit. 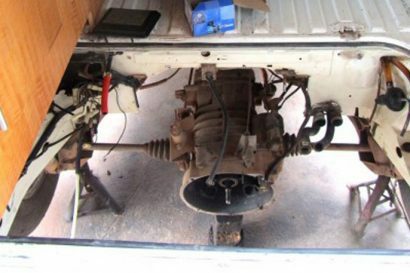 Because of the lag of power and the missing low-range gearbox, the T3 Syncro was really struggling. 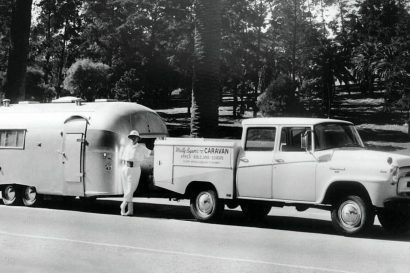 It wasn’t long before we had our first recovery missions. The situation was even worse for the bikes. 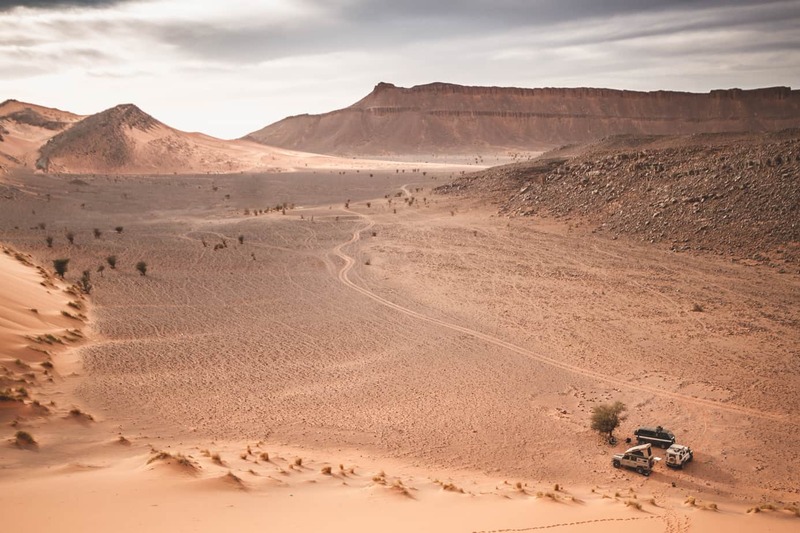 The sidecar made it nearly impossible to get through the sand, so they went back to camp instead to enjoy the view and some cold ones. It could be worse I would say. With the Defenders, we had almost no problems, and corner after corner we learned a bit more of what is needed to succeed here. The challenging part was how to attack the really big dunes. Too fast and you will have some serious airtime, too slow and you won’t have to do any more workouts for the day. The trick of figuring out the speed that is needed to reach the top is knowing when to stop. Stop the car right at the top and it’s digging time. Stop it right after the peak and it will make it easy to go on. 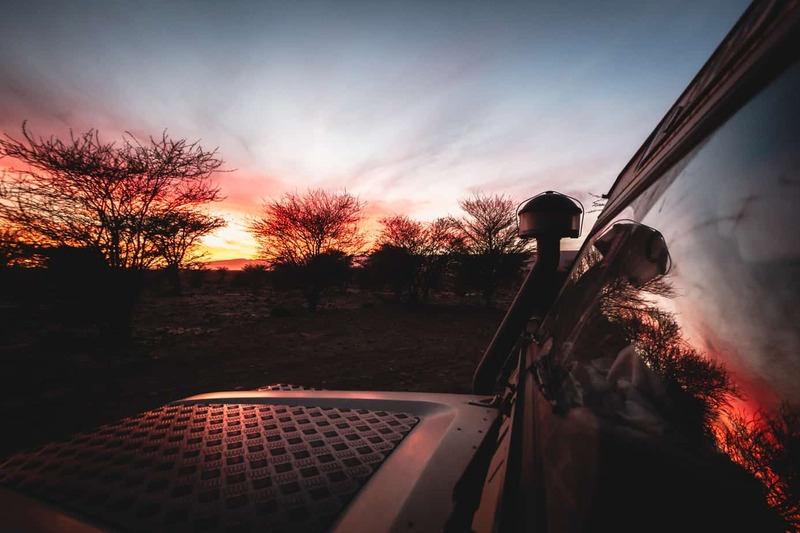 After a day of fun in the dunes, we went back to camp and enjoyed the sunset. The scenery we witnessed that evening was spectacular. With the sun setting, the red sand began to glow even more. Everybody was quiet and calm, just soaking up the moment. We slept in the middle of the dunes and that really was a dream of mine. It was why we built and love this car, and the experience was what I had imagined every single evening back at home. When it’s all dark and nobody is around, there is that silence all travelers talk about. In my eyes, that’s pure freedom. The next day we were heading south, always closer to the Algerian border. 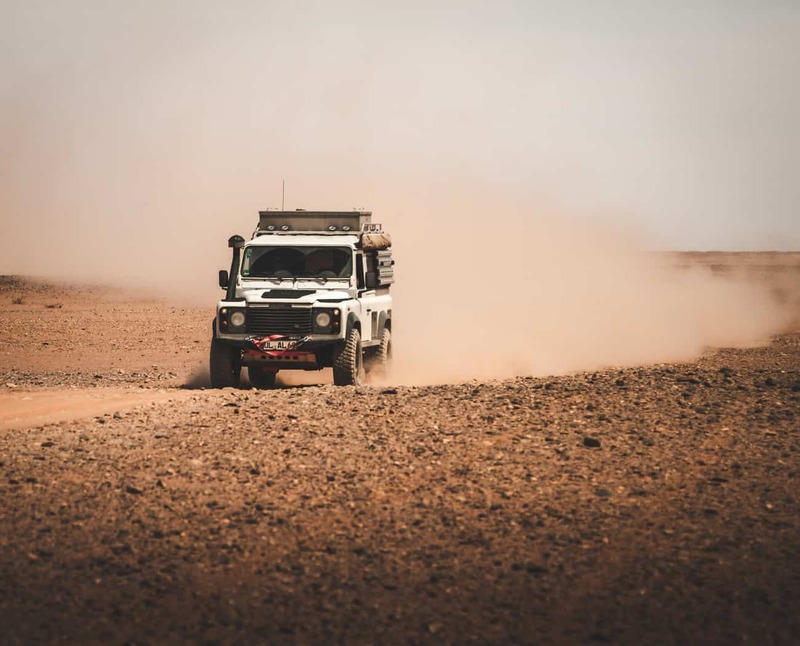 The tracks were changing constantly between deep sand, rocky terrain, and hard-packed gravel roads. It was especially difficult on gravel roads to find the right speed. 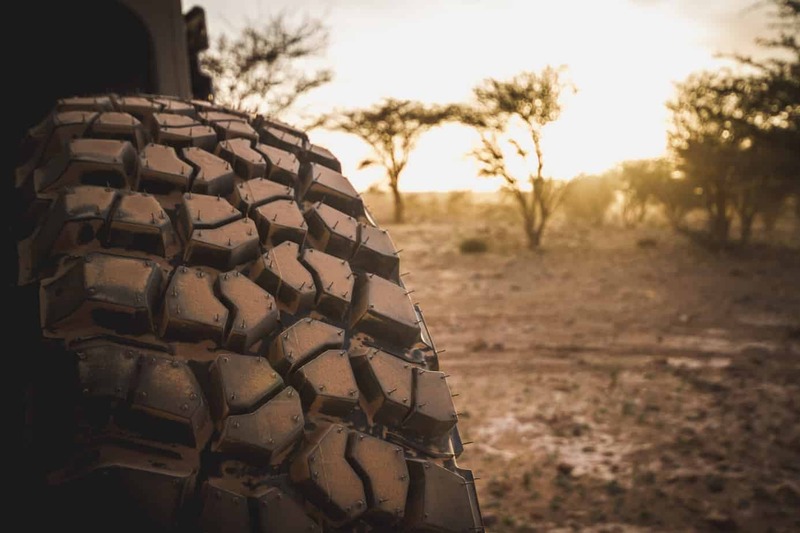 No matter how low your tire pressure was, the corrugations and potholes would wreak havoc on the trucks, and we were scared that we would break the rig into pieces hearing the noise. Sometimes you just have to go fast to get rid of that rattling noise. After hours of challenging but exciting terrain, we reached another highlight. A former lake called Lac Iriki, which is a flat and dried-out riverbed that spreads over several miles. After the days of rattling, it felt like heaven to drive on this “smooth” flat surface. You really can get up to speed on that plateau, and that was exactly what we did. We hammered it over the plains and had a laugh, but then out of nowhere, there was this minicreek crossing in front of us with no time to brake or to slow down. What can I say? Looking back at it, we were pretty lucky considering how much airtime we had. Thankfully, we all upgraded to some quality suspension, so the situation could have been much worse. 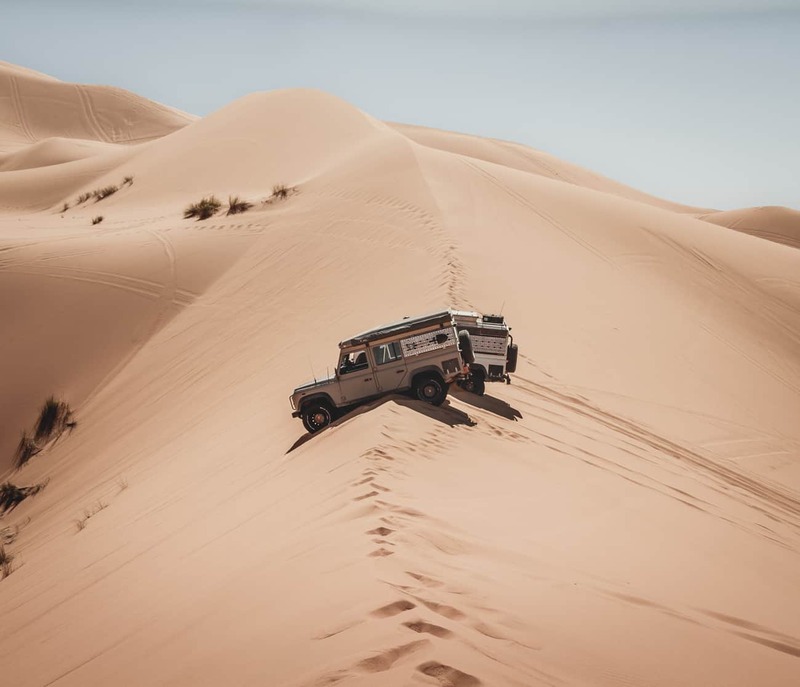 After some weeks in the desert, it was time for some sightseeing, so we headed to Marrakech, another highlight you have to check out in Morocco. Because our time was limited, we didn’t have the chance to explore the other interesting cities like Fez, Meknes, or Essaouira. But Marrakesh, what a place! A city that mixes up all the cultural aspects we had seen over the weeks, full of life, smells, and wonderful sounds! It’s beautiful. 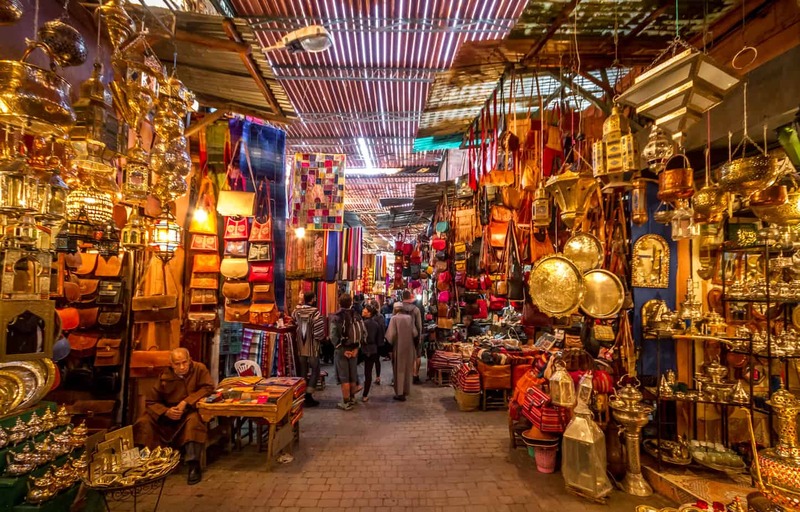 Entering the world-famous souks is like diving into a whole new world. Forget your GPS; you will get lost anyway. Yes, it’s pretty touristy in places, but if you leave the main path, you will find some of the unique Orient souk vibes. I really don’t know how, but we managed to get to the destination we wanted to. 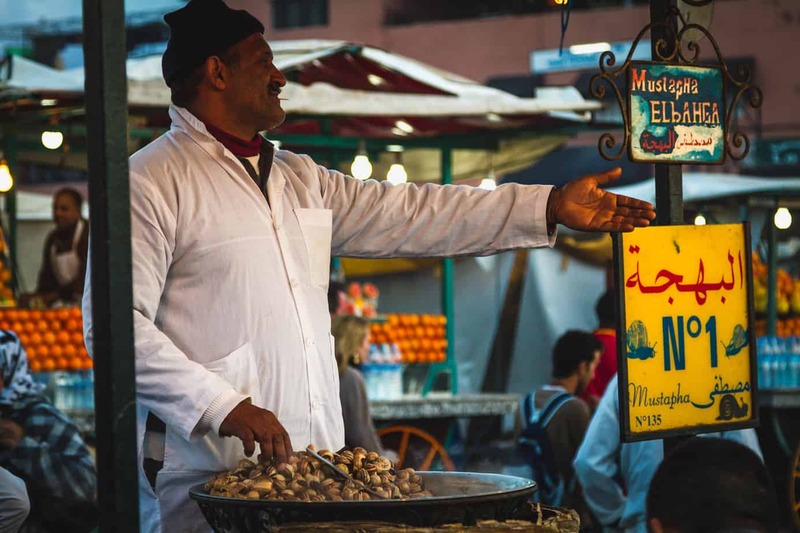 The Djemaa el Fna is a big square that comes to life in the evening hours. The enormous food market produces the most interesting flavors you can imagine. It’s the dream of 1001 nights! All good things must come to an end, and so it was with this trip. It would take a while to work out what we had seen and experienced, but the journey changed our whole mindset and perspective. Hopefully, we can keep these feelings for a long time. On our way home, we took the ferry from Morocco to the southern part of France. Some 2.5 days at sea, but it was somehow needed to process all of the experiences and impressions we made over the last weeks. 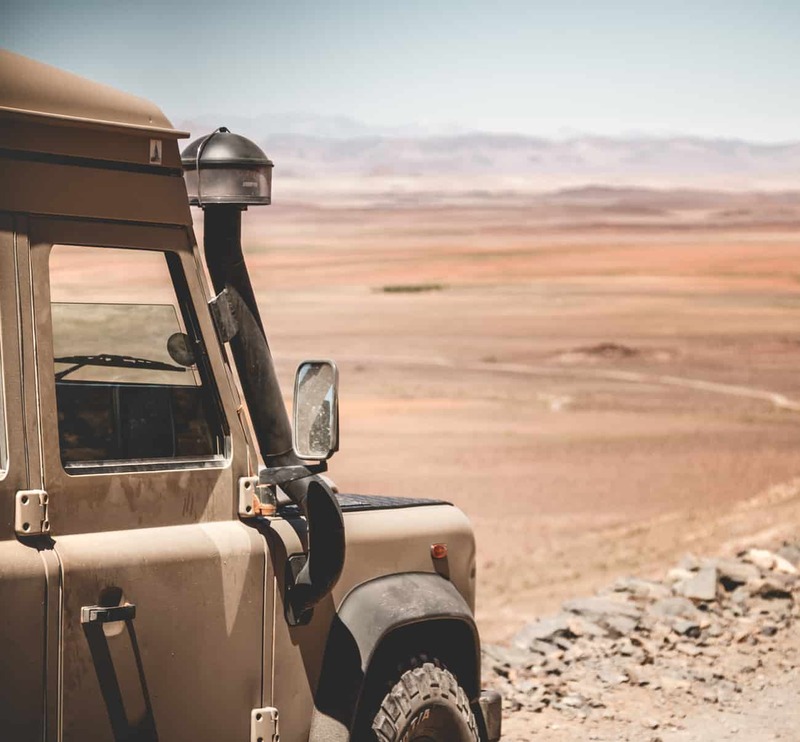 Morocco, we only visited you once, but one thing is for sure: we will come back to enjoy your beauty, your love, and your warm hospitality again. Markus Wollenberger was born and raised in Berlin, but his passion for photography took him to the south of Germany where he could be much closer to the Alps, and escape on weekend adventures. 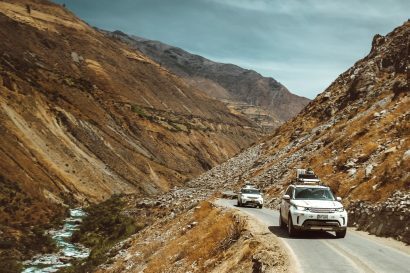 As a family of four, overlanding has become the perfect way for Markus to show his kids the world around them while sewing the seeds of travel in their hearts. It has also become his new passion as a photographer, as it allows him the pure freedom to be creative with the most beautiful landscapes around.